The story of Soho's Christmas lights began last year, when patrons and residents decided it was high time that our little village had its own lights at Christmastime. The 2015 switch-on event was a small but charming affair, where we had music by Tim Arnold and carols sang by the Soho Parish Primary school choir. Monty Python's Terry Gilliam did the honours and gave Berwick Street a festive twinkle for the first ever time. This year, we have a slightly bigger occasion planned, where the lights will spill out onto Brewer Street, and year on year we hope the event will grow into something spectacular. We really wanted to celebrate the character of the neighbourhood, and we are excited to say that the lights themselves have been designed and created by God's Own Junkyard - a Soho institution all of its own. God's Own Junkyard have been making Soho neons since the 1950s and they have an amazing collection that is often displayed all over the world in galleries and studios. They are responsible for the famous 1954 Paul Raymond sign, a Soho icon, so we are confident that they will inject a little cheekiness into the Christmas spirit! And of course, how could we not mention the special lady who will be doing the honours this year - the wonderful Joanna Lumley! Joanna was asked to be involved after she campaigned to keep Berwick Street Market independent last year and has been a long-time champion for our neighbourhood. 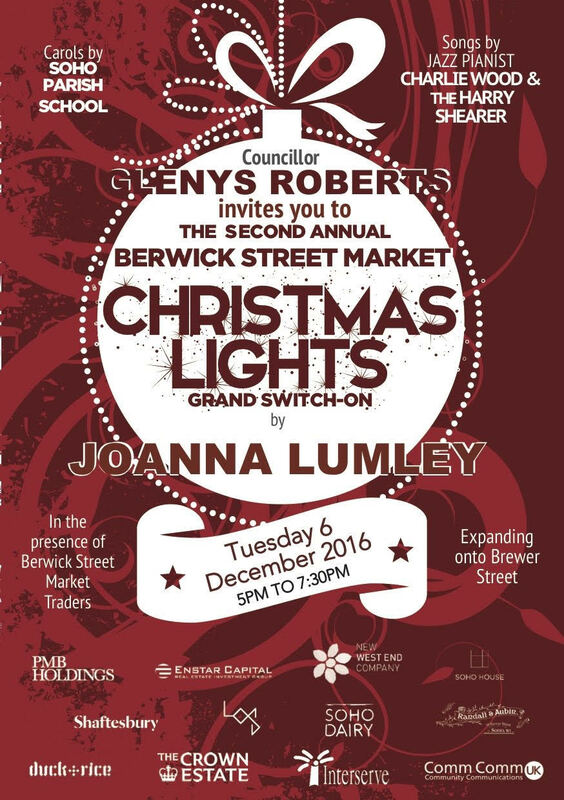 We have organised the event alongside Westminster councillor Glenys Roberts and we've gained support from local businesses such as Lights of Soho and Soho Dairy, while money has been donated by many developers around the area. The whole process has a real 'coming together' of the neighbourhood, which is what Soho is all about. So, we hope you can join us on Berwick Street from 5pm, where we will be serving mulled wine, mince pies, and a whole lot of Christmas sparkle - we look forward to seeing you there! 18:30 Christmas songs performed by Charlie Wood ..
Valentine's Day at Randall & Aubin - prepare to be lovestruck! Week 3 Oyster Festival and it's Kilpatrick! Father's Day - nothing in moderation! Ideal Home Show - The promised Lamb Chops Recipe!!! Are you a Soho Local? Crab Cake Burgers Maryland Style! © 2014 Randall & Aubin. All Rights Reserved.